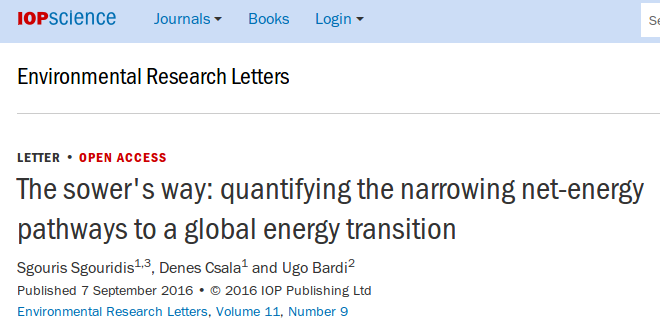 Our paper on "The Sower's Way" has been published in the IOP Environmental Research Letters journal. It is an attempt to quantify the physical limits of the energy transition from fossils to renewables. The title of the article takes inspiration from a strategy well known to ancient farmers, the fact that they had to save something from their current harvest for the next one; it is the origin of the common saying "don't eat your seed corn!" Starting from this ancient wisdom, we performed a quantitative calculation of how much "seed" we need in the form of fossil fuels in order to have enough energy to build a new "harvest" of renewable energy that can replace the old one. All that without emitting so much CO2 that we would go over the 2°C limit and without anyone being left out. Of course, it is a calculation that depends on a lot of debatable parameters, but we did our best to remain within realistic consideration, without asking for technological miracles or drastic reductions in the human population. 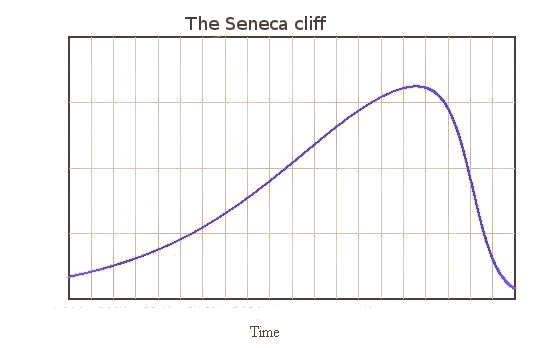 We just assumed current technologies and that the population curve would follow the UN projections. At the same time, we recognize that perpetual growth is a dream that only madmen or economists can think as possible. We assumed that humankind would gradually move toward a stabilization of the economy and of the population on a level of per capita energy sufficient to survive. You can see how we assume a rapid growth of renewable energy, built up in the beginning using fossil energy but, in the later stages of the transition relying on renewable energy to continue the process, while phasing out the fossil fuels which are completely abandoned by around 2060. 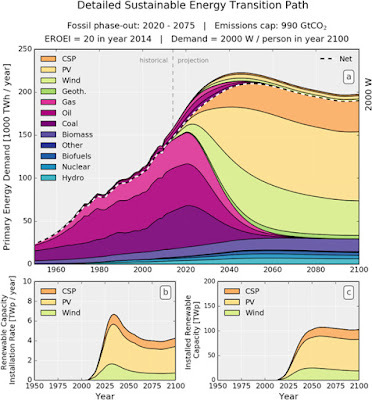 In this scenario, emissions do not go over the COP21 limit. So, our calculations don't confirm the pessimistic assumptions of those who see humankind as doomed. At the same time, we don't confirm the overoptimistic assumptions of some people who see the transition as easy. It will not be. If we want it, we have to pay a high price for it and to start paying right now. We need to step up investments in a new energy infrastructure of at least an order of magnitude. Not easy, considering the state of the debate, but not impossible, either. It is a big challenge, but there is still a chance for a better future for everyone if we want to take it. The paper is open access on IOP Environmental Research Letters. Comments on this blog are welcome. "If it were done when 'tis done, then 'twere well It were done quickly." Time scales and rates of change matter. What do you think of this 'paper in progress' from Stanford? I worry about optimistic assumptions in the Stanford paper. They assume for example a technical fix for the airline industry. Given that Airbus I understand has a current timeline for development out to 2080, I am less than 'optimistic'. To borrow from the previous recent post on Peak Oil, if the recent large increase in US oil production which cut the amount imported (USA remains a large net importer of petroleum) cannot fix the American economy - which still has the structure essentially of an imperial metropole - I wonder how much wiggle room there is? Is globalisation necessary for the transition, and will globalisation survive? I like your paper by the way, but am not competent enough to examine your methodology. Jacobson et al. worry about the technical feasibility of the transition, and that's a correct point to be worried about. Once the technical feasibility is established, however, the question is if we can make it fast enough and with the resources we have. And I am amazed at discovering how few people worry about that, apart from those who worry so much that they decided that we can't make it and they will be happy to return to stone age. I don't undestand why renewable energy shorten after the transition. Specially when for then there will be desired to increase even more the renewable power to raise the living quality of more people on nowadays poor countries. This is not a prescriptive outlook or forecast but a descriptive, mapping exercise. The paper essentially answers the question: what is the rate of RE installations if we wanted to provide XXXX W/capita net available power by 2100 with total CO2 emissions being limited to ZZZZ Gtons. I recommend to download and read the paper as it discusses quite a few of the nuances but of course it does not cover all aspects of the transition nor does it aspire to. On the question of industrial processes below, I do agree that this is an important aspect to consider carefully but electricity can provide as high temperature as the process needs if adapted appropriately. The innovative aspect of the paper is that it quantifies the physical factors related to the transition: how much energy you need for it and how much fossil fuels you need to burn to get it in the initial stages of the transtion. It is all based on the energy return of the various systems involved. Of course, but it seems to me that a similar amount to actual consumption power is under the total renewable limits of the planet by a great margin, and because a lot of people in the world will try to get better living standards, we will push the total consumption to a higher limit. Perhaps something like 100 TW-400 TW. Of course, with less growing until reach that limit with a steady state economy at last (both, consumption per capita and total population). I guess, perhaps you can confirm this, it's assumed that we will reach a limit not because renewable sources itself but by another limits like some materials like copper or something like this (discussed another times). I don't think that this materials will constraint anything in long term though substitution of more available ones. I suppose that the limit will be reached by our perception that produce more things generate more problems than less, so I think that the final limit will be more close to this numbers, by the pressure in the environment and our desire to preserve it when we will reach a high quality life for all. "Then, someone should put down a real plan"
These trends have gone relentlessly in one direction and correlate with the massive reinforcement of previous 'globalisation'. Such 'revolutions' in 'efficiency' and ‘productivity’ have come in phases. It is not difficult to argue for instance that contradictions within structures of modern American employment and income distribution were financially expressed in 2008 causing a sudden and disruptive recession. The ‘advanced world’ appears then to have been 'saved' to date by the growth of China's economy, itself dependent on a gigantic (unrepeatable!) increase in the rate of coal extraction sufficient to enable the installation of modern large scale industries. China still needs increasing imports of petroleum to manage let alone increase the structures they have created; not least the substitution of motor cars for bicycles. I can create a plan for myself but am at a loss to understand this new civilisation that I now find myself in. The Britain that I grew up in ran almost everything on coal - and was structured as an 'imperial metropole' - until the Petroleum Age dawned in our country when I was in my teens. I remember as a child being taken to the proto-airport at Heathrow, London, when it was just beginning to operate. By 2014 Heathrow handled about 75 million passengers in one year. I don't buy "the back to the stone age" rhetoric. Incidentally I live in an area that was part of an extensive 'stone age' civilisation that seems to have evolved over a couple of thousand years over-lapping into the Bronze Age. I was recently able to see some fine decorated pottery at the site of a monument that was part of an extensive ritual centre back in the day 4000 to 5000 years ago. Smile. The importance of this paper is the it demonstrates the there is a feasible path, but as Mr. Bardi previously noted "it is not enough to have access to natural resources. It is necessary to be able to distribute these resources in such a way to keep all the sections of society supplied; this is a question of control." As the paper itself acknowledges that "Policy mechanisms should be in place to commit to appropriate RE targets and prioritize the allocation of economic resources from other activities to meet them. Such long-term planning requires government direction towards specific but technology-agnostic RE deployment targets. A critical aspect aiding such decisions is that the targets themselves become a factor in driving the economic competitiveness of the RE alternatives." The application of SET is beyond the current realm of possibilities. Apart from no body having sufficient control, the bulk of the population is unaware of the problem. Perhaps, after a catastrophic credit collapse there will be sufficient non renewable resources remaining to implement such a plan, especially if the total energy needs are greatly reduced. There are many crucial industrial processes that require high heat only practical from burning fossil fuels, sustaining a renewable energy infrastructure without the same would be daunting. There is no limit to the heat you can generate with electricity. But for heat, direct heat use would be preferable. For example, concentrated solar preheating and reach optimal temperature through electric currents. There is biomass too, although it can scale only to a small fraction of consumption. I like the concept, the approach, of “The Sower’s Way” very much! I am motivated to read the paper itself (which will take me a while, for reasons irrelevant). There is yet a gap (not so much a gap as a yawning chasm) in futurology studies of any serious investigation of “…and how do we get there from here?” When the auto industry was still a world so young-and-all, parts traveled from shop to shop on carts pulled by draft animals. Sober and serious investigation of how much fossil fueled power is needed to build a self-sustaining renewably-powered future, with respectful debate about the parameters and assumptions. These are daunting questions, with no opportunity for easy bumper-sticker answers. But even addressing them is at least a partial answer. This is very helpful information. Once I found the supplementary data, the S5 representation with 510gt budget is the only one worth considering imo. The higher budget pathways carry so many risks of amplified damages (from all sorts of directions) and are, a priori, unconscionable. Prior to this analysis I thought the slim window of feasibility was already closed, now I think it is slightly ajar for a year or two more, practically extinguished thereafter. Your comment about population possibly indicates a similar position. A massive immediate effort on a global scale is the obvious prescription, the patient still appears obstinate and unwilling.. I am one of those who think our future is likely to be "stone age", and my crude modeling seems to confirm it. But I would like to be proved wrong, so I need to know more. I am suspicious that you show Peak Oil/Gas/Coal occuring in 2020, when as far as I am concerned Peak Oil and Coal have already happened (discounting deliberate loss-making exercises to maintain the impression that the future is still rosy). I am also suspicious of "RE's composite ERoEI" of 6.7 - 60, which seems to me to be at least 3 times too high. Maybe I am mistaken. do you have it in spreadsheet format? Also the individual RE types energy budgets over time? 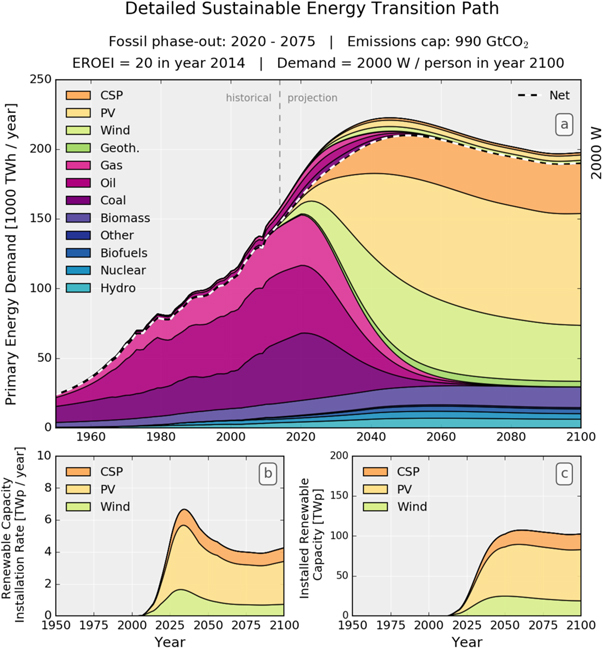 Vuuren's RCP-2.6 has Gas production trebling by 2070, and I can't square that with reality or your energy profiles. Maybe you are right, Palloy, that the peak is already here. That would make everything way more difficult. Thanks for the article. A question: Have you, or anyone you know, looked at financing the expansion of renewable energy? As background, the world currently has around 200 trillion US dollars of actual debt, with additional trillions of payments which have been promised but are not legal debts. After looking at the remaining oil which the Hill's Group model, which was reproduced here by Dr. Louis Arnoux, says is feasible to produce, and assuming that each barrel has the capacity to pay down 10 dollars worth of debt, I conclude that perhaps 20 trillion of the 200 trillion can ever be repaid. (Assuming that events such as revolutions or societal failure will not occur, even when it becomes apparent that the debts will never be repaid and all the 'wealth' represented in Davos is a mirage.) In short, the world is broke. *financial tinkering to provide the needed funds? *a command and control economy responding to dictates from a central authority? "To have any chance of preventing dangerous climate change, the world needs to reduce greenhouse gas emissions to net zero or even negative by mid-century. Many experts suggest this means we need to completely phase out fossil fuels and replace them with renewable energy sources such as solar and wind. We are strongly sympathetic to the need for a rapid global shift away from fossil fuels. But new modelling conducted independently and made publicly available by my colleague at the Understandascope, Josh Floyd, suggests that such a transition may face significant challenges." "It makes sense to electrify trucks since fuel from oil, coal, and natural gas is finite and unsustainable, and biomass doesn’t scale up (and probably has a negative EROI or at best, is close to break-even). Sustainable electricity generation is impossible without trucks. For example, trucks are needed from start to finish in the life cycle of wind turbines — from the trucks needed to carry the 8,000 components from dozens of factories world-wide to the factory where it is assembled, to the cement and other trucks that prepare the wind turbine site and take the wind turbine to its destination, and to build and maintain the roads the wind turbine arrives on, as well as the transmission lines and towers that connect wind turbines to the grid. Since without trucks, civilization shuts down within a week, there is no higher priority than keeping trucks running. So it is very important to see if trucks can be electrified, or if a 100% renewable electric is even possible, or there’s no point in using the remaining fossil energy to build windmills, solar PV, nuclear, and other electricity generating installations. If trucks can’t be electrified and/or a 100% renewable grid isn’t possible, the remaining fossil energy would be better spent on energy conservation, insulation, conversion of industrial farms to organic agriculture, smaller and more widely spread grain storage facilities,passive solar homes and buildings, lower speed limits, and so on. Although trolley buses run on overhead wires in several cities, there are usually only a few hundred or less running 15 minutes apart. Scaling that up to 20,000 heavy-duty freight trucks that run just seconds apart, if that is even possible (we don’t know yet), is so energy-intensive that very few stretches of roads could be electrified." 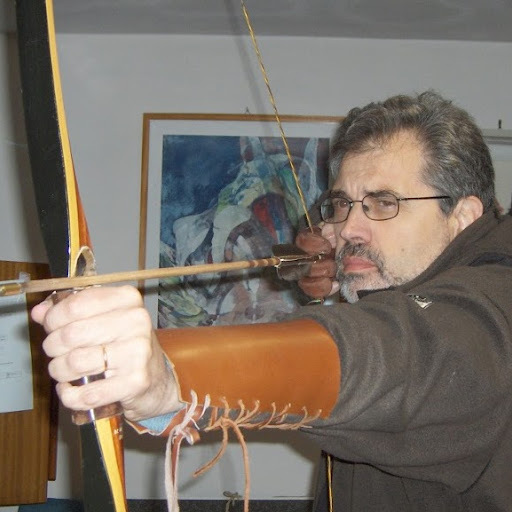 I have been a follower of your thought since you organised an ASPO Conference in Umbria 2009, ( I came on an overnight bus to Italy) and have been a fan of Sgouris Sgouridis since his presentation in Edinburgh in 2013. I am glad to see from your comment that you want to learn more from farmers. I see that Rudolf Herren is a member of the Club of Rome. In my view he is a well-informed scientist as well as farmer. Quote from Wikipedia: ‘Herren is an outspoken proponent of agro-ecology, organic and other forms of sustainable agriculture’. A few facts – last checked about 10 years ago but roughly similar now. Almost all nitrogen fertiliser is made from methane, needing about 5% of world usage per annum; confirmed back in 2008 as a rough estimate by the International Fertilizer Industry Association. China for economic reasons made a lot of urea from coal, and probably still does. A lot cheaper than ‘nitrogen from electrons’, and probably still is. The USA is certainly tied to fossil fuels. Their urban industrial (‘Western’) model would have collapsed in the 1920s without large scale industrial inputs into agriculture; synthetic Nitrogen fertiliser in particular. But they have a lot of methane ongoing. England trebled its population after 1750 before synthetic fertiliser and well before fossil fuel mechanisation. A new agricultural system had taken in more land, but crucially had sustained ‘natural’ soil fertility and indeed had increased available soil N, in places by as much as a factor of 3. The system, although potentially sustainable, hit its limit around 1850. After that in the face of a further trebling of population England and Britain, almost entirely urban by mid-20th C, has relied on large scale net- imported food (calories), not just on modern fossil fuel and cropping on its own acreage. PS Wasn’t Norway’s hydropower going to be the ‘battery’ to stabilise the rest of European grids in the face of fluctuating solar and wind? In the absence of power derived from biomass that need becomes a lot greater. We were supposed to be getting one or more of those for the UK. There are existing natural gas pipelines of course. While it is possible to heat homes and operate conventional farms with electricity, it is of course much more inefficient in terms of energy use. Essential industrial processes like making steel will also be challenging. What is your view on Richard Heinberg's book Our Renewable Future (http://ourrenewablefuture.org/) and his conclusion that we would hit limits to conversion of global capacity at around 60% due to intermittency, storage and transmission issues?